This cute Halloween bat has a felted wool ball for the base. Everything else is made from stiffened craft felt besides the large wiggle eyes. This is a quick and easy DIY project for kids! First, visit the craft tutorial on how to make giant felted wool balls here. Create at least one of these using a green wool roving. They are very easy to make in four steps and only a few supplies using your washing machine to agitate the wool. I recommend making several at once. These giant felted balls work well for all sorts of adorable character heads. Check out my Autumn owl tutorial or my Halloween bat tutorial for a couple of other Fall craft ideas. For the the mouth, nose and scar, use chalk to freehand draw outlines on the black stiffened felt and cut them out. These pieces need not be perfect! They actually look better if you make them a little quirky according to your own taste. If you are at a loss hand drawing, check out Pinterest or do a Google search for Frankenstein patterns to use. I personally prefer freehand drawing everything, but do what works best for you. Also cut two bolt shape pieces from the gray stiffened felt. 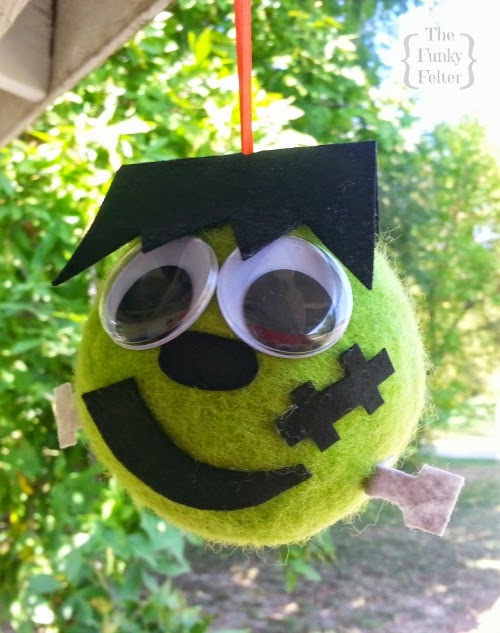 Hot glue the mouth, nose, scar, bolts and wiggle eyes to the felted ball as seen in the photo. For the hair, cut a rectangle from the black stiffened felt about the width of your ball and twice that for the length. Then cut triangular notches from one end. Fold the rectangle in half creasing the felt. Hot glue each folded side down with the notches framing the face. Finally cut about an 8 inch length of thin ribbon knotting one end. Cut a little hole in the top of the hair's peak. Insert the knotted end of the hanger and glue into place on top of your Frankenstein's head. If young children are making this, they will need adult supervision while using the hot glue gun. You could substitute thick tacky glue letting all the pieces dry in place over night instead. For the best glues to use on various kinds of felt, check out my post here. I give my top choices for adhesives along with pros, cons and helpful tips.